(Nanowerk Spotlight) The U.S. Food and Drug Administration has published a handbook called the Bad Bug Book which provides basic facts regarding foodborne pathogenic microorganisms and natural toxins. It contains all you always wanted to know about Salmonella, E. coli, parasitic protozoa, worms, viruses and natural toxins and other stuff that, when it gets in your hamburger, as it does from time to time, can make you pretty sick. It can even kill you. The Centers for Disease Control and Prevention (CDC) keep some pretty scary statistics and estimate that foodborne pathogens cause approximately 76 million illnesses, 325,000 hospitalizations, and 5,000 deaths in the United States each year. Three pathogens, Salmonella, Listeria, and Toxoplasma, are responsible for 1,500 deaths each year. Salmonella is the most common cause of foodborne deaths and responsible for millions of cases of foodborne illness a year. Sources are raw and undercooked eggs, undercooked poultry and meat, dairy products, seafood, fruits and vegetables - so basically more or less everything you eat. Early detection of foodborne pathogenic bacteria, especially Salmonella, is therefore an important task in microbiological analysis to control food safety. Several methods have been developed in order to detect this pathogen; however, the biggest challenges remain detection speed and sensitivity. A novel nanotechnology-based biosensor is showing great potential for foodborne pathogenic bacteria detection with high accuracy. "Early detection of foodborne pathogenic bacteria is critical to prevent disease outbreaks and preserve public health" Bosoon Park tells Nanowerk. "Current detection techniques such as ISO method 6579, fluorescent-antibody (FA), enzyme-linked immunosorbent assay (ELISA), or polymerase chain reaction (PCR) are time-consuming, cumbersome, and have limited sensitivity." Park, an Agricultural Engineer at the U.S. Department of Agriculture, was part of a team that included scientists from the University of Georgia and the Korea Food Research Institute and that developed a novel and effective food-borne bacteria detection method. "Our nanotechnology based biosensor has shown great potentials for protein, virus, and bacteria detection with high sensitivity and high resolution" says Dr. Yiping Zhao, an Associate Professor of physics at the University of Georgia. "This bio-functional hetero-nanorod detection method has great potential in the food safety industry as well as in biomedical diagnostics." The research team, which also included Dr. Ralph A. Tripp from the Department of Infectious Diseases at the University of Georgia, fabricated a hetero-structured silicon/gold nanorod array by the glancing angle deposition (or GLAD) thin film method and functionalized it with anti-Salmonella antibodies and organic dye molecules. Due to the high aspect ratio nature of the silicon nanorods, dye molecules attached to the silicon nanorods produce an enhanced fluorescence upon capture and detection of Salmonella. Park explains that traditional microbiological techniques – such as ISO method 6579 – for detecting foodborne pathogens take up to five days to obtain a positive result, including pre-enrichment, selective enrichment and confirmation of colonies, which are time-consuming and labor-intensive. Another downside of culture methods is that they show poor sensitivity when there is only a low level of contamination in the samples. 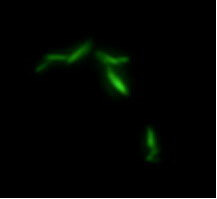 A number of investigators have used the fluorescent-antibody (FA) technique for Salmonella detection. Although FA procedures offer considerable time savings, a large number of the pathogen needs to be present in samples in order to observe detectable fluorescent signals. This usually meant that enrichment culture techniques were required prior to immunofluorescence microscopy. Consequently, the FA procedure for Salmonella detection has not been in routine use. We have written before about nanotechnology's increasing role in building sensors that can reliably detect foodborne pathogens. Zhao lists some of these nanotechnology enabled techniques: detections by luminescence using quantum dots; localized surface plasmon resonance of metallic nanoparticles; enhanced fluorescence; dye immobilized nanoparticles; or Raman reporter molecule immobilized metallic nanoparticles. "All the nanostructures used for the biosensing applications have two characteristics" he says. 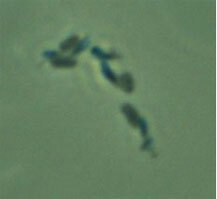 "First, they contain certain recognition mechanisms specified to the analyte, for example, antibodies or enzymes. Second, they are able to generate a distinguishing signal from the analyte and this signal could be generated by the nanostructures themselves or produced by signaling molecules immobilized or contained in the nanostructures." Junxue Fu, a graduate student in Zhao's group and the paper's first auhor, points out that for single component nanostructures, it can be difficult to immobilize the recognition molecules and signaling molecules simultaneously. Hetero-nanostructures provide a promising platform to solve this problem. Thus, different functional molecules can be immobilized to the different components of the hetero-nanostructure to enhance selectivity and specificity of detection. In their experiment, Zhao, Park, Tripp and collaborators managed to capture a single Salmonella bacterium with the antibodies conjugated on the gold and detected by thousands of dye molecules immobilized on the silicon nanorods. In principle, the protocol developed in this study could be used for detecting other foodborne pathogenic bacteria such as E.coli, Staphylococcus, Campylobacter and food toxins such as Ricin, Abrin, or Clostridium Botulinum if the proper antibody is selected for the conjugation with nanorod substrates. Additionally, the fluorescent detection dye can also be replaced by other types of dyes or potentially quantum dots that may allow for multiplex detection. This novel nanobiosensor could have broad appeal to the food industry, food safety inspection agencies, government agencies overseeing food safety, and researchers focused on safety and biosecurity research.